Want to be included in tag search results? Click through to the Biography tab at your Edit Profile view. At the bottom, you can add up to ten tags. 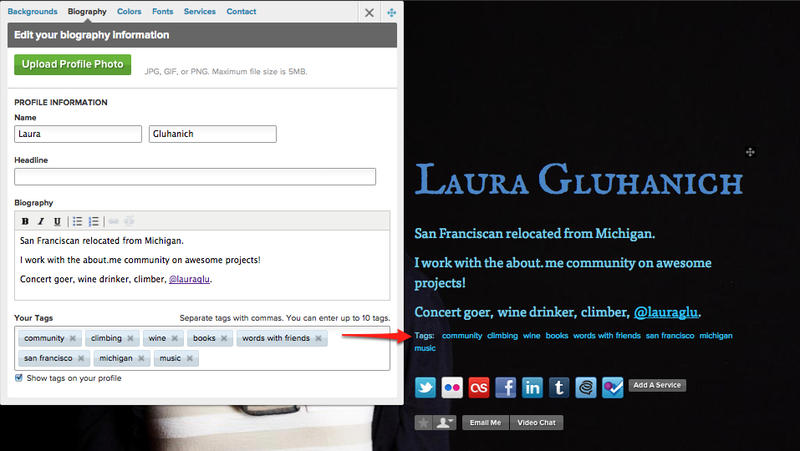 As you can see, a tag can include multiple words, like “San Francisco.” Then choose whether you’d like for them to display on your page or only be used for searching. It’s been a blast finding obscure and interesting categories on about.me. We’ve started using this search to find pages to feature in our directory as well. Have you added a unique tag to your page? Let us know here in the comments. Thanks Olivier – what tags have you added? Oh yes, sorry = blog, revue, olivier, Burma, internet, weblog. Have a good day ! Nice idea! I can find people who have the same interests! I love my tag “creativity”! Awesome! We’ll have to check that one out. Love it! I am curious, is it possible to create a page – a collection of people – and somehow control who can be in this group? Or, is it possible to create “a public favorites”? For example, a group of board members of professional association linked from the association site, or a group of bloggers of a company blog, etc.? Hi Vanessa. We dont have a product built that will allow you do that. However, you can build directories of about.me pages that live externally – http://www.trueventures.com/founders/. Let us know if you have any questions about how they did it. Thanks.